With the warm weather of spring and summer comes the height of the gardening season. Beginning each year in February, our garden centers start filling up and brimming over onto plant start carts. 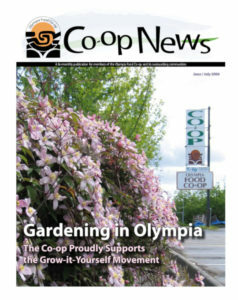 At the Co-op, not only do we want to offer you the best quality food on our shelves, we also want to encourage folks to grow their own food and flowers. A fantastic and instant way to get a head start in your Garden (thanks to growers with greenhouses) is by planting plant starts. We are pleased to feature a changing seasonal selection of plant starts from local farmers and growers. From tomatoes to lavender, copra onions to bee balm, and stevia to pansies, we carry unique, locally grown plant starts for your planting or gift-giving pleasure. 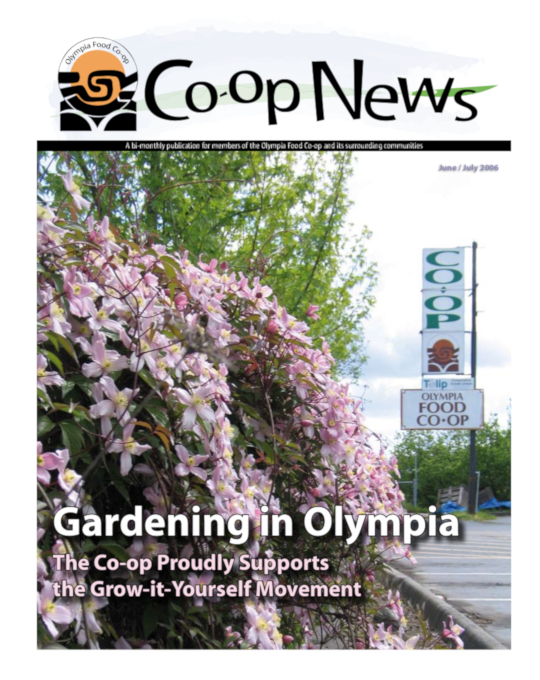 Please see the list of the Co-op’s local garden suppliers in the chart below. This year we are glad to carry Barefoot Soil Deluxe Potting Mix and Barefoot Soil Earthworm Castings from Yelm Earthworm and Castings Farm. Available in 1 cubic foot bags, the potting soil sells for $11.89 and contains coir fiber, their famous earthworm castings, and assorted minerals. (Please see their article in this newsletter issue for more soil information). Yelm’s earthworm castings, also in a 1 cubic foot bag, sell for $10.59. Need less than a cubic foot of castings? Try locally manufactured Wiser Worms Earthworm Castings in a ½ cubic foot bag. We also carry Wiser’s Worm Tea in a 16 oz bottle for only $4.75. In addition to worm castings and worm tea, we also carry Black Lake Organic’s Optimum Mix (B.L.O.O.M.) fertilizers. Each specialty fertilizer is packaged in a 5 lb. bag and sells for $8.00. The Co-op carries the following B.L.O.O.M. fertilizer mixes: All Vegetables, Maritime Complete, Garden Essentials, Organic Lawn, Rhody and Blueberry, Tree and Shrub, and Cranberry and Strawberry. For a liquid option we also carry Earth Juice brand fertilizers and Liquid Fruit and Bloom 2-5-1 fertilizers. If you want to make your own potting soil or mix some lighter material into heavy soils, consider using Coir Fiber made from waste coconut husks. The eastside store carries 4.5 cubic foot blocks, and the westside carries an 8”x 4”x 2.25” brick. The Co-op also strives to carry essential gardening equipment. We carry a variety of sizes in blue Atlas gloves, grey Atlas Therma Gloves, and new this year are West County Gardener Gloves. They come in 5 styles: fingerless, landscape, rose, work, and waterproof, and range in cost from $13.00 – $20.00. West County Gardener gloves come in a range of bright colors. We carry hand tools such as trowels and pruners, jute twine, trellis netting (which is great for pole beans), birdscare tape to keep your beans safe in the early stages of growth, landscape fabric to keep the weeds out of your garden, and hoop house PVC clips for making your own inexpensive hothouse. Additional season extender products are also available at both stores. We have bulk wooden row markers for only $.03 each. For watering, we carry spray bottles for seedlings and German made 5-liter watering cans for larger plants. New this year are dolphin and dinosaur shaped watering cans in your choice of bright red, orange, or green. A backyard garden can make all the difference as a peaceful place to relax. We carry wind chimes made in Japan that are available in a variety of shapes and sizes. Some of our favorites are the whale, snail, seal, turtle, and flower chimes. We also carry blown glass hummingbird feeders. If you are stuck without knowing precisely what you should be adding to your soil or how to solve a problem in your garden, try checking out the Washington State University King County Extension website. As an online resource, it has numerous gardening fact sheets covering a myriad of gardening topics specific to the Pacific Northwest. The Timberland Public Library system also has a very extensive collection of gardening resources.